Loss prevention is one of the most important tasks in managing your pharmacy business. PCRS claiming, loans, and stock management are just some of the areas where money can leak. Even more important is knowing your patients, how often they visit, how many you have lost, etc. Analysis 365 gives you the power and the accurate information you need to make informed decisions around customer retention. Analysis 365 monitors every aspect of your trading, in a visually appealing format, and is actionable to ensure you are achieving optimal margins. With tight margins, volatile markets, and changing customer demands, pharmacy retailers can’t rely on intuition alone to drive growth and adapt to change. They need data-guided insights. Analysis 365 offers powerful visual analytic insights to respond to the demands of the industry. Our reports put everything that’s important at your fingertips, in an easy, visual, and actionable way. 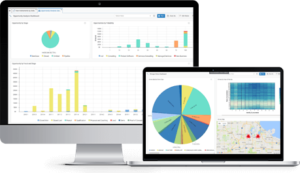 Analysis 365 can provide you with a suite of fully integrated tools that allows holistic analysis of data throughout all management levels within the business. This enables you to spend more time interpreting reports rather than preparing them, and allows you to prioritise actions and improve decision making. Contact us to speak with one of our team about Analysis 365 today! Book a demo today to see the full benefit of TouchStore RX!